If I scream, and you scream, what are we all screaming for? The answer, of course, is ice cream. Or maybe it’s cake. Or it could be tarts. Or caramel, or crêpes, or puff pastry, or custard, or mousse, or soufflé, or… holy bananas, make it stop. I mean, not permanently. I love ice cream. And cakes and tarts and caramel and crêpes and all those other delicious treats. But I’ve been up to my elbows in pastry all week and I’m not sure how much more I can take before my teeth rebel and deteriorate and my body decides it’s had about enough, thank you, and forces me to collapse into a sugar-induced coma. So there. 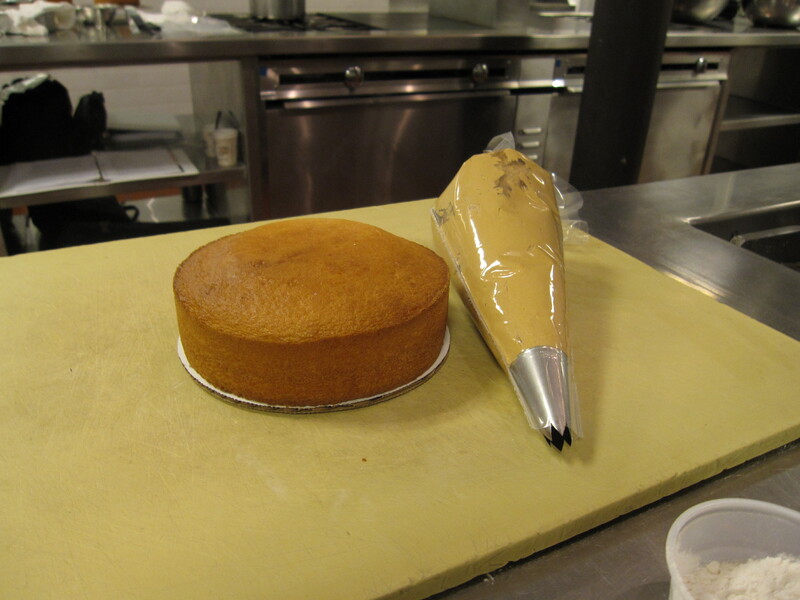 It started last Monday with tart dough. 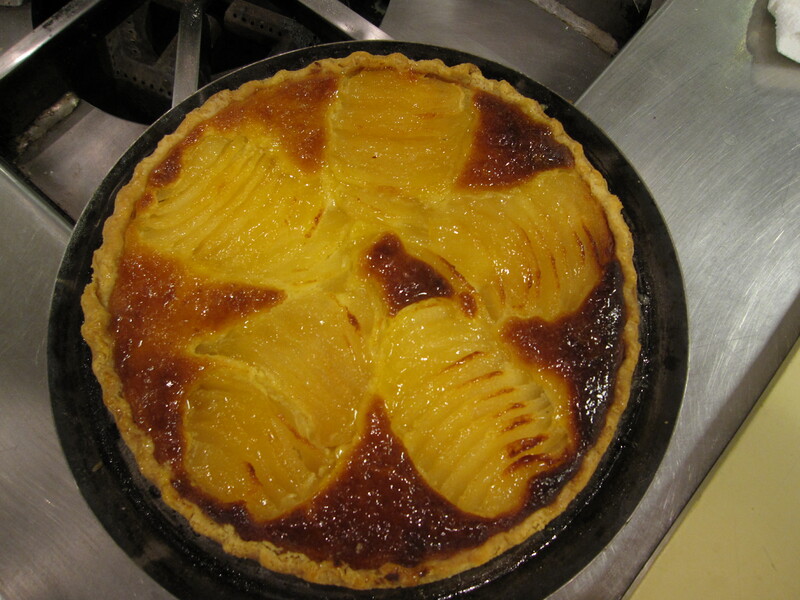 There I was, happily mixing and rolling out pâte sucrée, making pastry cream, slicing apples and pears, warming up the apricot glaze. It all seemed so wonderful! 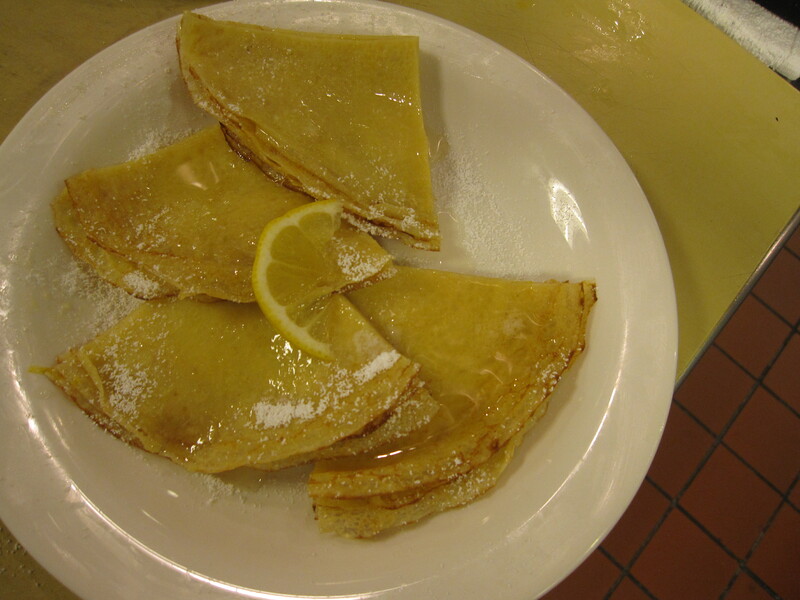 So flaky, so sweet, so… innocent! I should have known better. Next thing I know it’s a week later and I’m hurling caramel ice cream down my throat and wrestling my classmates for the last bite of chocolate mousse. Ahem. Don’t look at me, I’m too ashamed. …Actually, it’s been sort of a great week. There was an incident involving the indecent hurling of caramel ice cream down my throat, but I’m happy to report zero incidents of chef knife dueling over the last lick of whipped cream. And, to be fair, that caramel ice cream was flipping delicious. I want to tell you about everything we made at school this week – from buttercream to ladyfingers to italian meringues, but I’m afraid I can’t tell you as well as I can show you. So, here you go… just a taste. Clearly, I had my fair share of sugary fancies this week. I wish I could accurately describe the deep, slightly bitter, nutty smoothness of the caramel ice cream to you, or the airy, buttery flakiness of the puff pastry fruit tart. 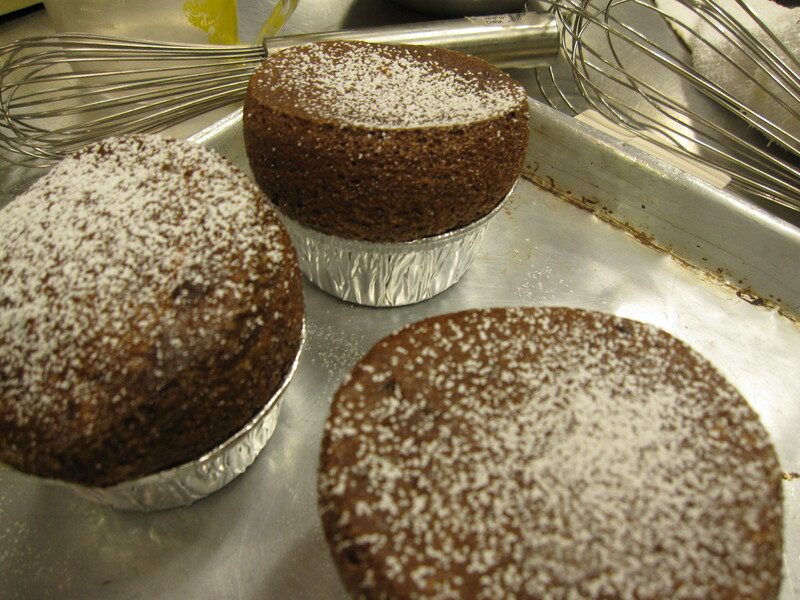 The rich smell of vanilla infused crème anglaise, and the delicate pear flavor beautifully enrobed in a soufflé. Sigh. I have the recipes for all of these things, and I’ll give them to you if you want them, but, for this post, I decided to go with the choux à la crème chantilly. “Shoe a la crem shantee-ee.” …That’s cream puff, to you and me. Caramel ice cream may be smooth and delicious, and chocolate soufflé may be rich and fancy, but the cream puff holds a special place in my heart. When I was a kid, we used to get them at the Wisconsin State Fair, along with grilled sweet corn and barbecued beef. My parents, grandparents, aunt, uncle and two little sisters would all squeeze around a dusty picnic table on the fairgrounds, right near the barns housing the prize-winning animals, the smell of cows and butter and fresh cream wafting around us. Someone would bring a big tray of freshly baked, Wisconsin cream puffs to the table, and we’d scoop them up and dig in, starting with the light, chewy pastry, quickly moving to the sweet, airy cream. Pretty soon we’d be sloshing whipped cream down our shirts and licking stray dollops from each other’s fingers. And then 2-year-old Casey would fall asleep and 4-year-old Emily would get upset that she spilled cream on her shirt and I, at age 6, would ask if I could please please have another cream puff. …Please? 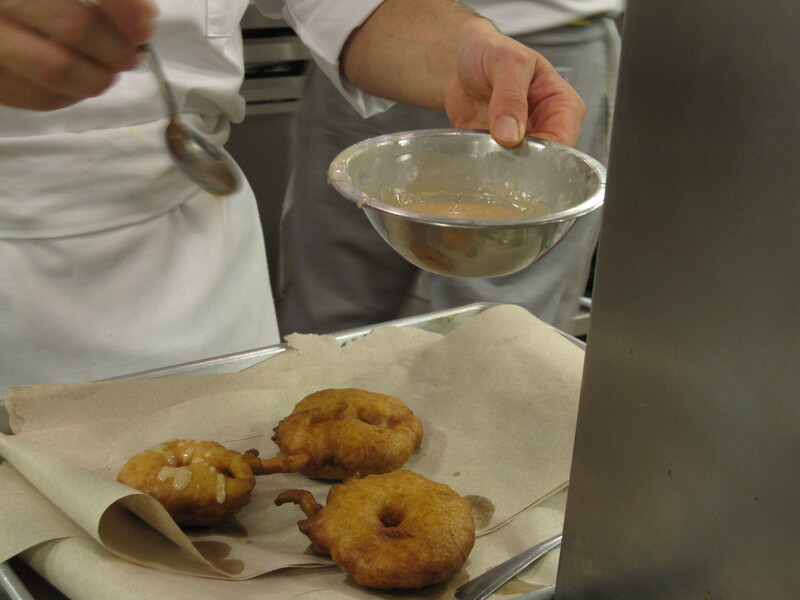 To make the choux dough, put the water, butter, salt and sugar into a pot and bring to a boil. As soon as the mixture reaches a boil and the butter is completely melted, take it off the heat and add all of the flour at once. Place the pot back on a medium flame and stir vigorously with a wooden spoon about 30 seconds, until the dough comes together and forms a mass that does not stick to the pan. Dump the dough into a large, clean bowl. Crack 4 eggs into a separate bowl, and add them to the dough one at a time, making sure that each is fully incorporated before adding the next. You can do this step either by hand with a wooden spoon or in an electric mixer using the paddle attachment. The mixture should be firm but smooth. You’ll know it has absorbed enough eggs when a spoon or finger run through the batter leaves a channel that fills in slowly, and a dollop of batter lifted on a spatula curls over itself and forms a hook. If the dough still seems too firm (if the channel formed by a spoon through the batter takes a long time to fill in), crack the 5th egg, break it up with a whisk in a separate bowl, and add drops of egg until the batter is just right. Preheat the oven to 350ºF convection (or 400º regular). 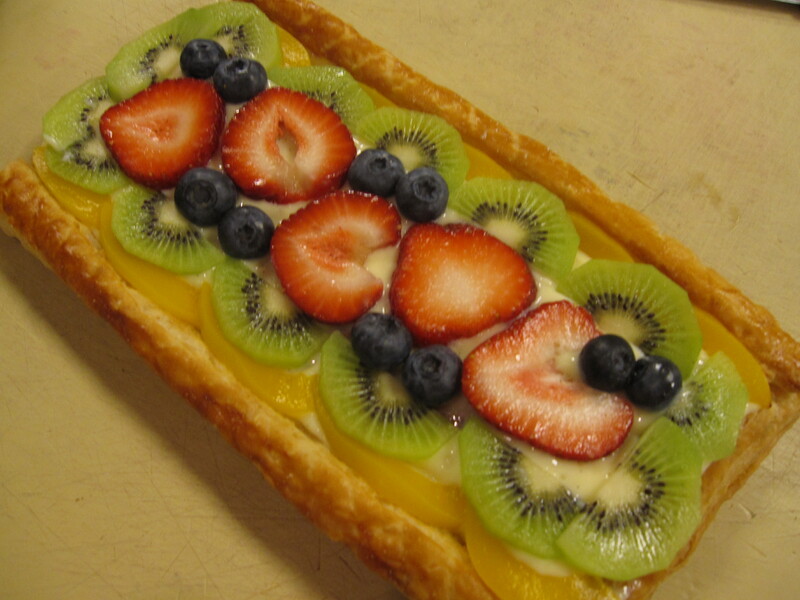 Fill a pastry bag with the choux batter, and pipe out small circles of dough onto a sheet pan lined with parchment paper. If you don’t have a pastry bag, you can make one by cutting off one of the bottom corners of a large, plastic ziptop bag. Just fill the bag and pipe the dough out of the little hole. 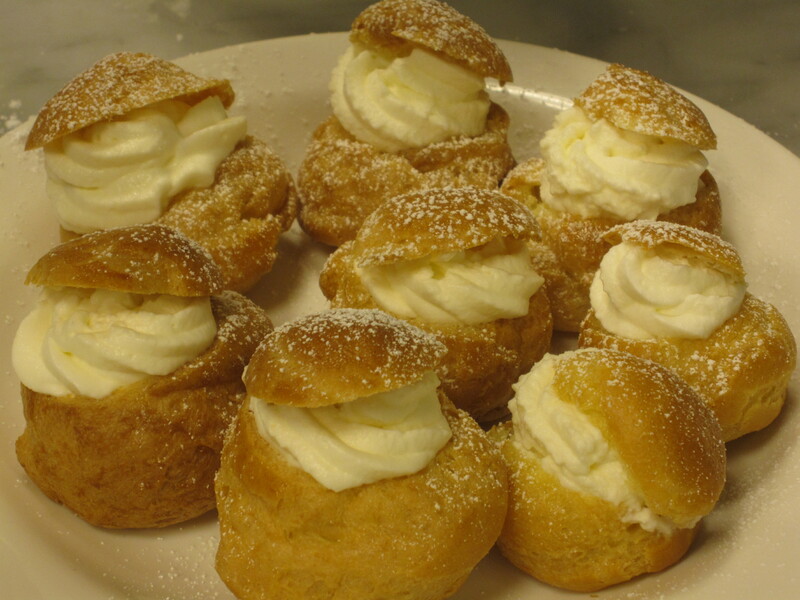 You can make your cream puffs any size you like, just make sure they are all generally the same size. 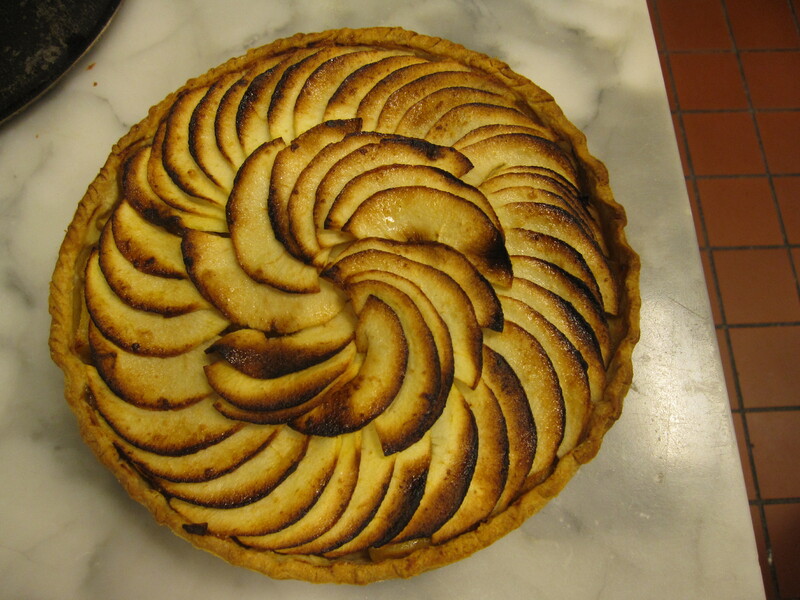 Brush the circles lightly with egg wash, and bake until the dough has puffed up and is a deep, golden brown. Turn off the convection oven, or lower the regular oven to 300ºF, and leave the choux in for another 5 to 10 minutes to dry out. Remove the choux from the oven when they are dry and feel light and hollow (if you’re not sure they’re completely dry, take one out and split it open. 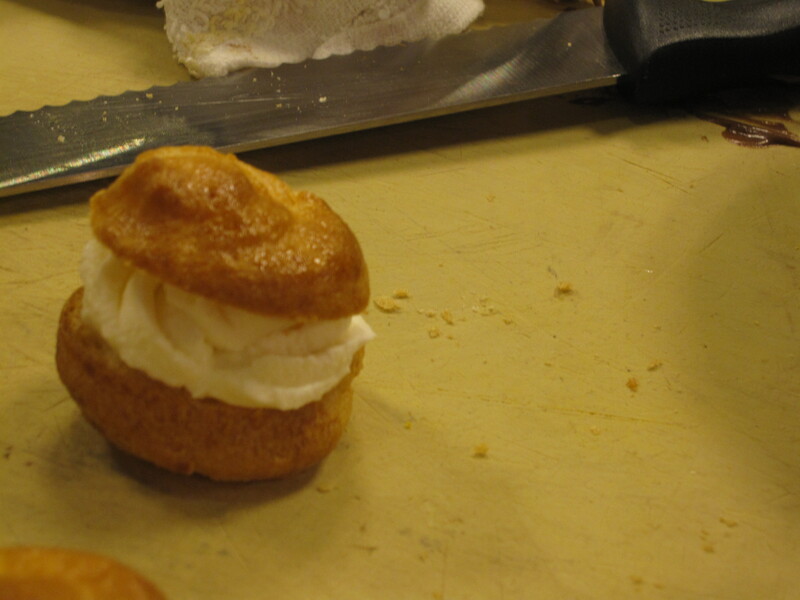 The inside should be bone dry – any moisture will leave you with soggy creampuffs.) 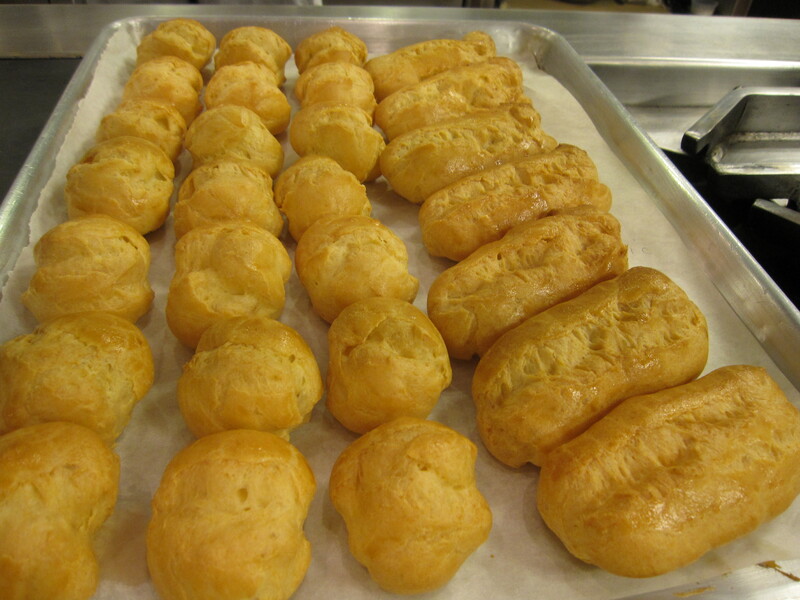 Allow the choux to cool before slicing off their tops and filling them with cream. To make the crème chantilly, beat the heavy cream (either by hand or with an electric mixer) until it starts to thicken. 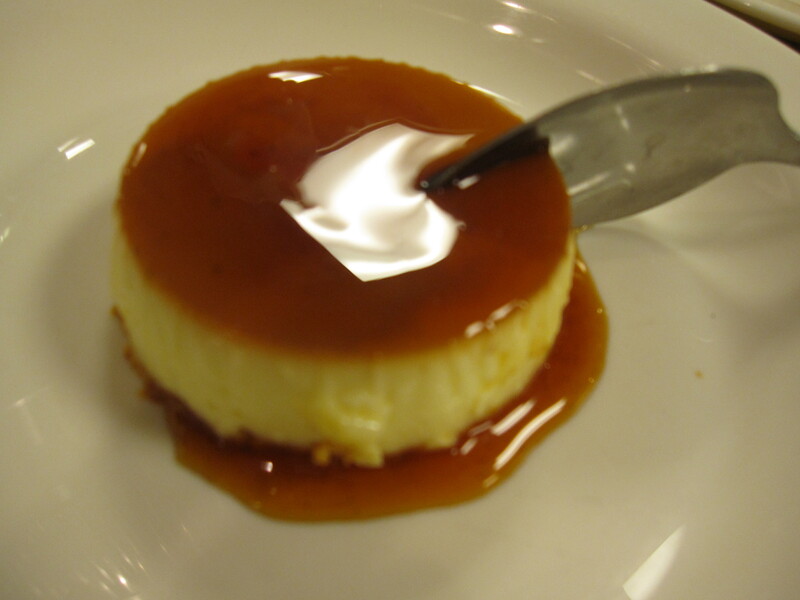 Flavor it with the sugar and a drop of vanilla, and continue beating until stiff peaks form. 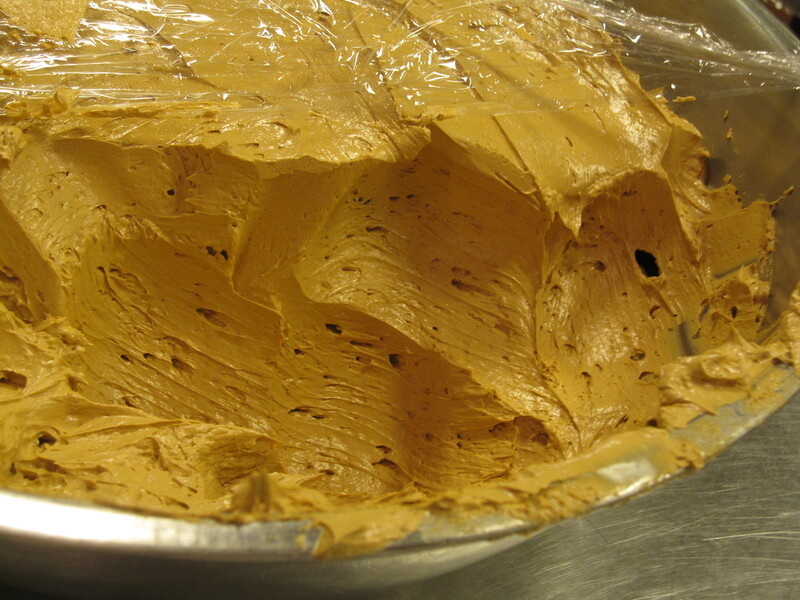 Be careful not to overbeat the cream, or it will turn to butter. Pipe the cream into the cool, dry choux pastries, and serve immediately. This recipe makes a lot of cream puffs (roughly 50) – feel free to halve or even quarter it for a more manageable batch of deliciousness. Your chocolate mousse may be the very best thing that I've eaten this year. I mean, wow! Your life is so hard. I am SO JEALOUS. I can't believe you're learning how to make all this! I would be 1100 pounds though because I'm missing a gene called SELF CONTROL.